The city below us erupted into a series of concussive bangs and was exploding all around us. We perched on the 21st floor in a beautiful apartment in Panama City and the fireworks stretched from one end of the horizon to the other. The fizzling multi-colored explosions shimmered between towering skyscrapers and twinkled in the sky below. We clinked our glasses of champagne and sat back to enjoy the show. While running from one end of the apartment to the other, unsure of which side to watch the fireworks. They were everywhere you looked. It was New Year’s Eve, which is always a symbolic end. But in this case it was also the real end of our massive road trip. We had driven from Seattle to Panama City, and our journey was coming to an end. Though a few more obstacles laid ahead–like the Darien Gap. The end of a year always provokes a bit of introspection, at least in me. What went well? What didn’t go so well? What do I want my life to look like in 2016? 2015 was a year of movement. We drove thousands of miles and explored nine countries in my truck (counting the USA). I started the year back in Seattle where I had celebrated the holidays with family. Then leaving in mid January to meet up with Andrea and her family for a trip to Miami and Orlando. We had a great time exploring the beaches of Miami, watching NASA rocket launches, and exploring Orlando’s theme parks. Andrea returned with me to Seattle where we spent more time with my family and friends. While also taking a few small road trips around Washington State to show her the beauty of the place where I grew up. While it wasn’t new for me, I did get to see familiar places with new eyes… Places that are so normal to me, but incredible to her (though of course, there will always be places back home that will take my breath away). In March we headed north to frozen Fairbanks in search of the Northern Lights, and we were not disappointed. It was an incredible trip, one that I will never forget. And one that was completely foreign to the both of us. In April we finalized preparations for our big road trip, and took a few more shakedown trips in the Northwest. In May, finally, we set out on the road and didn’t look back. We jetted down to Flagstaff, Arizona over the course of two weeks, to make it to the Overland Expo. From there we explored the beauty of the American West from the Grand Canyon, the national parks of Utah, to Las Vegas and Los Angeles. It was a varied and incredible two months on the road. Including a few places that I hadn’t visited before, like Horseshoe Bend. In July, with Andrea’s visa to the USA running out, so we crossed the border into Mexico. Our first stop was a peaceful house sit in the remote mountains of Baja California. We took care of animals, hiked through the mountainous desert, and just enjoyed the tranquility of the place. I was able able to a great deal of work done on my book. In August we continued on to Mainland Mexico and made it to Mexico City for another house sit in the heart of a modern global city. Mexico City was incredible, a great surprise. The house sit was the polar opposite of Baja, but we loved every minute of it as well. In September and October we finished exploring Mexico from Oaxaca to Chiapas to Yucatan. Mexico is an incredible varied and amazing country. Worthy of even more exploration. I turned another year older in Belize, in October. But it was a birthday that I’ll never forget: eating lobster and hanging out on the sleepy island of Caye Caulker. November saw us exploring Guatemala and passing through El Salvador, Honduras, and Nicaragua. December brought us more outdoorsy adventures in Costa Rica: driving through rivers and remote tracts of land. Then we passed into Panama where we met up with my Mom to celebrate the holidays. 2015 was a year of moving forward and being on the go. It wasn’t always easy, but it was definitely worth it. The blog continued plugging along alright, nothing spectacular. But I was finally able to launch my first product, the Desk to Dirtbag “Go Outside” t-shirt thanks to the folks at Adayak. I was also able to launch my bestselling Amazon.com Kindle book, Big Travel, Small Budget: How to Travel More, Spend Less, and See the World. The book skyrocketed up the charts, and has gotten excellent feedback with 94 reviews and a 4.6/5 star average. I worked hard on that book, and I was both excited and scared to release it to the world. But I’m so glad I did. It continues to sell copies almost every day. After years of being active in climbing, hiking, mountaineering, etc, 2015 was my least active year in a long time. There were no major climbing trips, no big peaks scaled. We still got out there camping for more than most people, did dayhikes and a few overnighters, but nothing exceptional. The go-go-go of the road trip, along with the increasing heat and humidity of Central America definitely zapped my desires. Though it was a year of constant road trip movement, it was a year of low physical activity. I have traveled through much of the northern half the country, from Cartagena, to Palomino, to El Cocuy, to San Gil and Bogota. But I have yet to explore much further south than Medellin. I never quite made it to my goal of reaching $1,200 per month in passive income with the blog, but I want to dedicate myself to that goal once again. Settling down here in Medellin again for the year will be the perfect opportunity to grow my brand and business. While continuing to make an impact in the world of adventure travel. To reach my goal I am aiming to release another three Kindle / paperback books this year… One is about my road trip of the American West, the second I had worked on before but never released, and the third about the road trip through Central America. Considering how long I delayed the release of Big Travel, Small Budget, a goal of three books is pushing it. But I think I can get it done with a lot of hard work. That will mean a book release every 4 months. April, August, and December. I had a lot of fun growing my Instagram account this year, from less than 300 followers to more than 3,800 as of now. By the end of the year I want to triple my Instagram followers and pass 10,000 followers before we continue our trip south to Patagonia. To kick things off right I have been using some awesome productivity tools like Focus@will which plays awesome music for working from classical, ambient, acoustic, etc and allows you to select your music tempo level and so forth to help you concentrate and get more done. I find focus@will to be great for my writing and work, as I usually get distracted by music with lyrics. I’m also experimenting with Rescue Time which tracks how I am actually using my time (and showing me where I am wasting my time all day). Like they say, what gets measured gets managed. Maybe you know you spend a lot of time on Facebook, but don’t realize just how much time you ACTUALLY spend there. My personal goals include picking up a cheap acoustic guitar and learning the basics again… Once upon a time I used to play but have left it for so long that I’ve lost it. I’d love to be able to rock out a few songs and just have fun with it again. I want to get back into the habit of reading again as well, for both personal growth and pleasure. Like most things I do, I go in fits and spurts. But I want to dedicate myself to reading at least 30 minutes every single day and reading at least 26 books by the end of this year. Knowing that I will be more ‘city bound’ this year as we settle back into life in Medellin, I want to ensure that I become more active again. For years I have been saying one of these days I’d love to run a marathon… But I never ever do anything to make that happen. I think 2016 should be the year. The Medellin Marathon is 9/11 this year and I want to make it happen… Which means going on regular training runs (at least 3x per week) at increasing distances. I’ve been using (and loving) the RunDouble App for Android. There is a 10k run here in Medellin on April 24, so that will be my first real test. I’ve never taken part in any organize race, not even a 5k. I have also attempted and failed (many times) to do that 100 pushups program (doing 100 consecutive pushups), which I aim to finally conquer. I would also like to incorporate other activities like yoga and the climbing gym at least once per week. 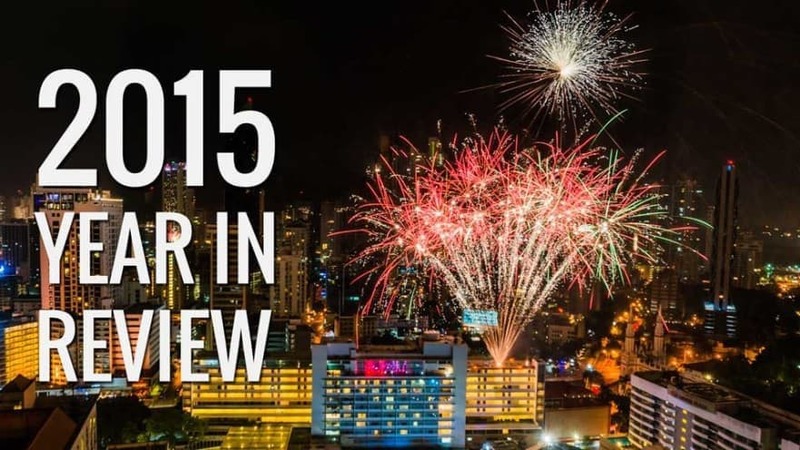 My 2015 in a nutshell, and my plans for how to make 2016 a great year. What do you have in store this year? What do you hope to do? How can we help hold each other accountable? Just received my copy of “Big Travel….Small Budget” and am really looking forward to cracking it open. I’ve started prepping/building-out my 2000 Tacoma to make it worthy as both a means of transportation and a livable place to call home while on the road. Thanks much, Ryan, for all your ideas and inspiration. Best to you as 2015 comes to an end and 2016 unfurls before us. That’s awesome Jay, so exciting to hear about making your truck camping setup come together. Are you part of the pickup truck camping group on Facebook? It’s now over 400 members strongs http://www.facebook.com/groups/truckcamping and so pleased to hear that you picked up a copy of Big Travel, Small Budget! Hope you get a lot out of it… Let me know your thoughts!